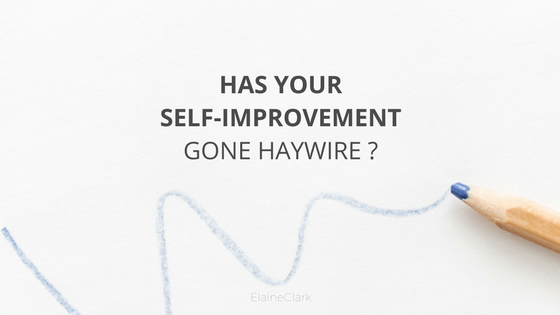 Has your self-improvement gone haywire? Ever feel like your self-improvement efforts are starting to burn you out? Do you get stressed out trying to keep up with all the success habits everyone else is doing? Many of us (myself included) harbour deep fears about not being good enough. Even when we follow strict daily routines, we feel guilty when we're not not drinking enough green juice or tracking the moon cycle, meditating, jade rolling, gratitude journaling ... the list seems endless! Our sense of worth is so tightly bound to how much we can jam-pack into one day. A part of us is always saying, "do better, be better, GO BIGGER!" It’s not surprising that a lot of us are struggling to feel good in our own skin. If you’ve been feeling overwhelmed about your self-improvement lately, this post is for you. Today I want to share with you a powerful guideline that's made a huge difference in so many aspects of my life. What’s one food that you love — but if you eat too much of it, can put you in (what I like to call) a food coma? Ancient Ayurvedic medicine teaches us the importance of leaving our stomach one-third empty when eating meals. This allows our digestive system a chance to efficiently break down our food and allows us to feel more energetic and light after meals. I LOVE the one-third rule — not only for preventing food comas, but for preventing self-improvement burn out! What if we intentionally left one-third of space in our daily schedule? What if that one-third of space is exactly what we need to be more productive and enthusiastic about our self-improvement efforts. When it comes to morning routines, daytime routines, and evening routines, there is no doubt we could choose to plan out every second of our waking days. Unfortunately, this is a huge detriment to our creativity. Space in our schedule is the breeding ground for inspiration and creativity. It gives our pre-frontal cortex a break in order for our sub-conscious mind to kick in. Have you ever noticed that some of your best ideas happen when you're day dreaming? We need downtime in our schedule to help nurture our creativity and to give inspiration a chance to work it's magic. Downtime also helps reduce stress chemicals and improves cognitive brain health. Did you know that too much rigidity in our schedule can actually lead to brain decline? Doing the same thing, day after day, leads to a decline in synaptic connections in the brain. Our brain is highly sensitive to spontaneity and new stimulation. When we allow ourselves space to chill out or do something spontaneous (like take a different route to work or spark up a random conversation or people watch) we encourage new dendritic branches and synaptic connections to become more enriched in our brain. If your day is not packed like sardines, don't beat yourself up about it. Don't feel guilt, unworthiness, shame or fear. Instead, use the one-third rule as a valuable guideline to restructure your schedule. Play, wander, daydream, and let spontaneity allow you to learn and discover something new today. Plus, it will make you feel so much more enthusiastic about your self-improvement efforts. Newer PostNeed a hormone detox? Help inside.